Vol. 1 only told half of the story – now comes Life And Soul Vol. 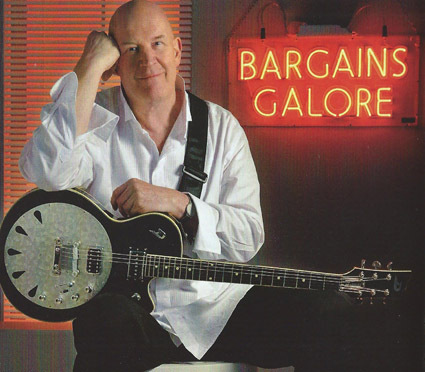 2 (Bargains Galore) telling the second part of JULIAN DAWSON’s adventures in music! When, five years ago, Julian Dawson decided to bring out a personally chosen ‚Best Of‘ compilation with Blue Rose Records, Life And Soul was the perfect title for a look back at a uniquely varied musical odyssey. Now comes Life And Soul Volume II, ‚Bargains Galore‘ (translates into German as something like ‚Reichlich Schnäppchen‘). With another eye-catching cover, a lavish forty-page booklet and three CDs packed with more than sixty songs, Volume II brings us up to date. Julian again picked his personal favourites from seven albums recorded between 1997 and 2017. The new package features more rare photographs from Julian’s personal archive as well as recording details, reminiscences and background stories to each and every song. Where Volume I loosely covered his major label years while fronting a band, the follow-up begins with Move Over Darling, his first acoustic venture, recorded in New York with producer Stewart Lerman and his old friend Steuart Smith (who has spent the last decade onstage with the Eagles). Julian has always displayed great taste in his choice of musicians and collaborators. The quietly compelling songs on Move Over Darling were graced by additional appearances from guests Richard Thompson, The Roches and soul legend Dan Penn (a constant presence throughout this collection). The Doris Day song of the title sat comfortably alongside audience favourites such as ‚If I Needed Rain‘, ‚All The King’s Horses‘ and ‚Pilgrims‘, all captured here in pristine form. Like Neil Young whom he much admires, Julian has never been afraid to change course or pursue a spontaneous idea. His next album Under The Sun, curiously his only recording ‚made in England‘, found him back in the studio with a full band. Old friends Kimberley Rew and Andy Metcalfe, both founder member of the legendary Soft Boys, were joined by Nashville all-rounder Daniel Tashian on drums and The Who sideman John ‚Rabbit‘ Bundrick on keyboards for one of Julian’s most satisfying collection of songs. Those chosen for Vol. II include ‚Amazing Disappearing Daddy‘, co-written with Dan Penn and the much-loved anthem ‚Four Walls‘, in the meantime often requested for weddings and even funerals. Julian was back across the water in California for his next outing, having met and made friends with multi-instrumentalist Gene Parsons, whose main claim to fame was, of course, as a member of the longest-standing version of the Byrds. For Julian, however, the high point of Gene’s career was his solo album Kindling, on which he played almost every instrument. Gene agreed to reprise that approach and on Hillbilly Zen accompanied Julian’s songs brilliantly on vocals, electric and acoustic guitar, bass, banjo, mandolin, pedal steel, drums and spoons! Not surprisingly the resulting tracks lean towards ‚Americana‘, with Julian obviously equally at home with country music, folk, bluegrass, blues and rockabilly. Bedroom Suite that followed, was another complete departure. The album was themed around relationships, and sessions took place in Julian’s front room. With a backdrop of simple drum machine patterns, the intricate songs were brought to life with beautifully understated arrangements. Well-chosen covers, including one of Dan Penn and Spooner Oldham’s most gorgeous and least known ballads, ‚The Lord Loves A Rolling Stone‘, augmented original Dawson titles such as ‚One By One By One‘ and ‚The Girl You Used To Be‘. Julian had fun experimenting with new skills such as trying his hand at Memphis-style horn arrangements. Where else would you hear a trombone on a George Jones cover? The intimate surroundings of Julian’s Somerset living room provided the backdrop for another album with an unusual theme running through it. The appropriately titled covers album Nothing Like A Dame was a collection of songs written or previously recorded by women. To show how different they could sound when sung by a male of the species, Julian’s choices included gems by Dolly Parton, Bobbie Gentry, Petula Clark and The Roches. The Shirley Collins song ‚Whitsun Dance‘ featured accompaniment by one of Julian’s earliest heroes, folk guitarist Martin Carthy MBE. The new collection features half a dozen songs Julian co-wrote with Dan Penn. Their long-standing friendship prompted an invitation to record another band project at Dan’s basement studio in Nashville. Julian handpicked the group of musicians from friends in Music City and the tracks were laid down with all the players in a room together, just like in the old days. Recording direct to tape, Dan’s collection of vintage microphones and analogue gear helped make Deep Rain a soulful and satisfying sound experience. There are three Dawson/Penn compositions on the album: the title track itself, ‚Walking On The Dead‘ and ‚Long Days, Short Nights‘. Dan added his legendary vocal skills to several tracks as well as producing and mixing the project. Julian decided to pick a live version of ‚That’s Why God Made Saturday Night‘ for its energy, instead of the original studio take. The new collection includes several unreleased ‚bonus‘ tracks: The radio only single ‚Christmas Every Day‘, an outtake from Deep Rain, finally gets an airing; Julian’s close friendship with Charlie Louvin is preserved via a live performance from Cambridge Folk Festival and there is a new version of ‚I’m Going To Miss You‘, recorded during last year’s Wolfgang Niedecken sessions in New Orleans, with Steuart Smith on piano, Leonard Cohen sideman Roscoe Beck on bass and Tedeschi-Trucks powerhouse JJ Johnson on drums. Bringing things right up to date and to show that Julian is still actively writing, is a brand new Dawson song, ‚East Nashville Blues‘, a wry commentary on the new Americana scene, with exquisite contributions from Richard Thompson (again) on acoustic guitar and from Jean-Marie Peschiutta on mandolin. Life And Soul Volume II is largely an acoustic affair, so it’s fitting that the third disc this time features not demos and rarities as on Volume I, but instead, with the kind permission of Iain Matthews and his colleagues in Plainsong, all Julian’s songs from his twenty-year membership of that group. All the titles he wrote and sang lead on, many of which were only ever available in the German-speaking territories, are collected here, including covers he brought to the table such as Richard Thompson’s ‚Galway To Graceland‘, Gene Parsons‘ ‚Gunga Din‘ and ‚Canned Heat’s Alan Wilson ecology hymn ‚Poor Moon‘. It is interesting to note that most of the characters that appear in Julian’s forty years of ‚adventures in music‘ are mavericks and often overlooked cult heroes. He learned important lessons from all his mentors and collaborators and those influences add up to a career unlike any other one can name. Julian’s attitude is summed up in the box-set’s last track, children’s song ‚Why Do I Do It’…The answer? Because it’s fun! Kommentare deaktiviert für Vol. 1 only told half of the story – now comes Life And Soul Vol. 2 (Bargains Galore) telling the second part of JULIAN DAWSON’s adventures in music! Volume 1 war nur die halbe Geschichte – nun kommt mit Life And Soul Vol. 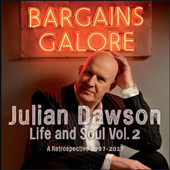 2 (Bargains Galore) die Fortsetzung zu JULIAN DAWSON’s Retrospektive! Welcome to Blue Rose: THE BLACK SORROWS!